A dedicated chapter on the competitive landscape offers information regarding the product portfolios, innovations, pricing tactics, marketing strategies, mergers and acquisitions, promotion tactics, distribution channel analysis, geographical spread, expansion plans, etc., of the high profile players involved in the competitive pipes market. The information on these tier companies is mined with the help of a strong research process followed at Persistence Market Research that covers the entire demand and supply ecosystem pertaining to the different segments discussed above. A thorough deep dive in all the segments considered for the research purpose on the competitive pipes market has enabled the research team at Persistence Market Research to dig in enormous data and collect statistics. Just a click away, the user can avail information on any segment, any region and any technology. Real-time analysis has increased the weightage of the research including a holistic angle to the market study that assists the viewers in chalking important corporate strategies pertaining to price, place and promotion along with regional forecasts. Competitive pipes are manufactured using several materials out of which steel is the most preferred, owing to its inherent properties such as tensile strength, compressive strength, durability, and anti-rust properties. The steel segment by material type is likely to witness significant growth in terms of volume and value in the global competitive pipes market over the forecast period 2016 – 2024 owing to an increased adoption of steel to manufacture competitive pipes. Persistence Market Research anticipates the steel segment to hold a massive 79% market share by the end of the forecast period. This represents an increase of 150 basis points in 2024 over the 77.7% value share held by the segment in 2016. A rapidly increasing demand for steel pipes from end-use industries such as the oil & gas industry especially for applications such as exploration, drilling, and transportation is expected to bolster market growth to a great extent. The other segments by material type namely copper, concrete, aluminum, ductile iron, and clay are slated to lose between 20 and 40 basis points over the duration of the forecast period. In terms of revenue, the steel segment by material type was valued at about US$ 69 Bn in 2016 and is anticipated to reach a market valuation in excess of US$ 99 Bn towards the close of 2024. This represents a CAGR of 4.7% during the course of the eight year study period. The steel segment is expected to record higher incremental $ opportunity than other segments – the segment is expected to create an incremental $ opportunity of about US$ 30 Bn between 2016 and 2024. There is a growing demand for steel pipes in various applications such as potable water, mining, municipal applications such as waste water, sewer, and industrial applications such as transportation of chemicals. 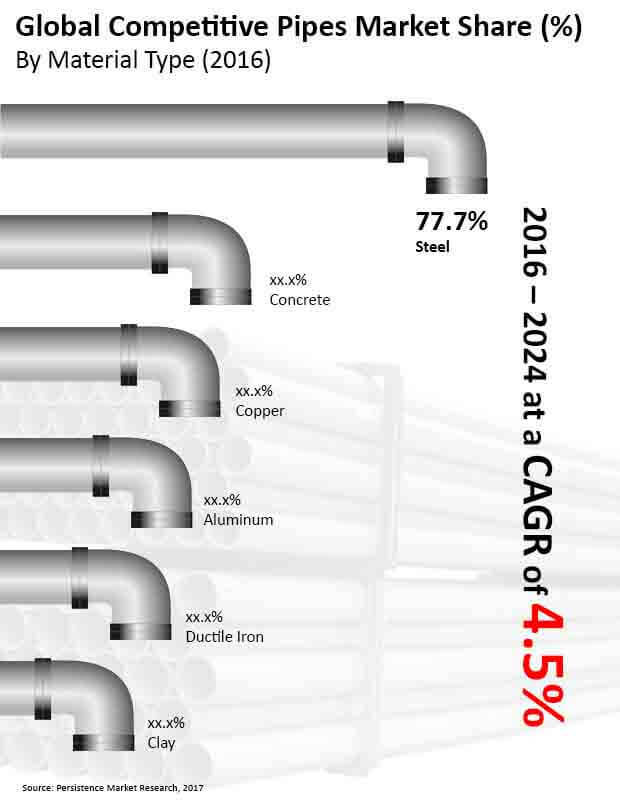 While the other segments are nowhere close to steel in terms of market share and volume consumption, concrete stands out next in line to steel as the preferred material for the manufacturing of competitive pipes. The concrete segment in the global competitive pipes market is anticipated to witness steady revenue growth throughout the forecast period and is slated to exhibit a CAGR of 4.1% in terms of value. Revenue growth of the concrete segment can be attributed to rising demand from the water and waste water management system. Increasing government investments for infrastructure development is another factor that is anticipated to drive the demand for concrete pipes during the forecast period. The last few years have witnessed increasing growth of industrial and municipal projects especially in the North America region. The rapid rise in urbanization in developing economies such as India, Indonesia, and China has resulted in an increased spending on public infrastructure such as water, power, and transportation services. Water being the basic necessity of the population, governments of various countries are implementing strategic initiatives to cater to a rising demand for water for domestic, agricultural, and industrial purposes. These initiatives are in the form of installation of new water pipeline networks that demand the use of pipes. This is likely to boost market growth in the coming years. Another key driver for market growth is the growing consumption of oil and gas in both developed and developing countries. Oil & Gas companies are focusing on expanding their production capacity through both onshore and offshore exploration activities to balance the demand and supply of oil and gas. An increasing exploration of shale gas in onshore exploration activities is expected to fuel the demand for and revenue growth of competitive pipes in the global market.